Join us for a FREE Dental Implant Seminar on April 17 at 6pm! Please sign up below so we know you are coming! When a tooth is missing, healthy teeth tend to shift towards the gap due to bone loss, affecting how our upper and lower teeth meet. Each tooth plays an important role in ensuring that teeth in front of or behind it stay in alignment, and maintaining the health of the jaw bone. Are minimally invasive. Your adjacent healthy teeth are untouched. Unlike conventional bridges, there is no need to grind down adjacent natural teeth. Implant placement has become the norm for saving fractured teeth that may have a questionable long-term prognosis. 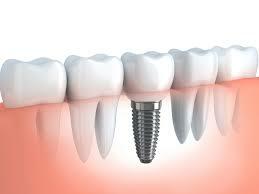 Implants have become the most predictable solution in many cases if a tooth has broken at or below the gum line. These teeth can be readily removed and an implant and a temporary crown can be immediately placed in one visit. On a daily basis, we have patients come in for an emergency appointment with a broken tooth (we see all emergencies, as well as any new patient, as quickly as possible and many times on the day they call). In the vast majority of cases, we repair these teeth with large restorations or crowns. These teeth may require root canal therapy if the tooth is not vital, and a post may also be necessary. On the other hand, broken teeth may have weakened roots, little tooth structure, or are hopelessly decayed and the current recommendation in dentistry is to immediately replace these teeth with dental implants. For example, we recently saw a patient that broke a tooth in the front of her mouth and there was no tooth structure that was readily visible. (See Photo 1) We reviewed the options of trying to save the tooth with a root canal and crown and gum work to expose the tooth, but the more predictable and guaranteed solution was to replace the tooth with an implant. At her appointment, we readily extracted the root structure that was left and immediately replaced it with an implant and a temporary crown. (See Photo 2) After years of studying the longevity of saving teeth with questionable outcomes, implants will give a patient more longevity. Also, the implant manufacturer and our office stand behind the success of the implant. Our patient left the office with an implant-supported tooth that looked totally natural that enhanced her smile. Our patients report very minimal discomfort and she was ecstatic over how easily we replaced her tooth and how fast the whole procedure was. As this service requires skills in removing the fractured tooth, placing the implants and rebuilding a natural looking tooth, not many dentists are able to provide it. With their advanced training, Dr. Caron and Dr. Bennett are excited to be able to offer this cutting edge service to their patients.